February 23, 2018 – Astronomers have used NASA’s Hubble Space Telescope to make the most precise measurements of the expansion rate of the universe since it was first calculated nearly a century ago. Intriguingly, the results are forcing astronomers to consider that they may be seeing evidence of something unexpected at work in the universe. That’s because the latest Hubble finding confirms a nagging discrepancy showing the universe to be expanding faster now than was expected from its trajectory seen shortly after the big bang. Researchers suggest that there may be new physics to explain the inconsistency. “The community is really grappling with understanding the meaning of this discrepancy,” said lead researcher and Nobel Laureate Adam Riess of the Space Telescope Science Institute (STScI) and Johns Hopkins University, both in Baltimore, Maryland. Riess’s team, which includes Stefano Casertano, also of STScI and Johns Hopkins, has been using Hubble over the past six years to refine the measurements of the distances to galaxies, using their stars as milepost markers. Those measurements are used to calculate how fast the universe expands with time, a value known as the Hubble constant. The team’s new study extends the number of stars analyzed to distances up to 10 times farther into space than previous Hubble results. But Riess’s value reinforces the disparity with the expected value derived from observations of the early universe’s expansion, 378,000 years after the big bang — the violent event that created the universe roughly 13.8 billion years ago. Those measurements were made by the European Space Agency’s Planck satellite, which maps the cosmic microwave background, a relic of the big bang. The difference between the two values is about 9 percent. The new Hubble measurements help reduce the chance that the discrepancy in the values is a coincidence to 1 in 5,000. Planck’s result predicted that the Hubble constant value should now be 67 kilometers per second per megaparsec (3.3 million light-years), and could be no higher than 69 kilometers per second per megaparsec. This means that for every 3.3 million light-years farther away a galaxy is from us, it is moving 67 kilometers per second faster. But Riess’s team measured a value of 73 kilometers per second per megaparsec, indicating galaxies are moving at a faster rate than implied by observations of the early universe. Riess outlined a few possible explanations for the mismatch, all related to the 95 percent of the universe that is shrouded in darkness. One possibility is that dark energy, already known to be accelerating the cosmos, may be shoving galaxies away from each other with even greater — or growing — strength. This means that the acceleration itself might not have a constant value in the universe but changes over time in the universe. Riess shared a Nobel Prize for the 1998 discovery of the accelerating universe. Yet another attractive possibility is that dark matter (an invisible form of matter not made up of protons, neutrons, and electrons) interacts more strongly with normal matter or radiation than previously assumed. Any of these scenarios would change the contents of the early universe, leading to inconsistencies in theoretical models. These inconsistencies would result in an incorrect value for the Hubble constant, inferred from observations of the young cosmos. This value would then be at odds with the number derived from the Hubble observations. Riess and his colleagues don’t have any answers yet to this vexing problem, but his team will continue to work on fine-tuning the universe’s expansion rate. So far, Riess’s team, called the Supernova H0 for the Equation of State (SH0ES), has decreased the uncertainty to 2.3 percent. Before Hubble was launched in 1990, estimates of the Hubble constant varied by a factor of two. One of Hubble’s key goals was to help astronomers reduce the value of this uncertainty to within an error of only 10 percent. Since 2005, the group has been on a quest to refine the accuracy of the Hubble constant to a precision that allows for a better understanding of the universe’s behavior. 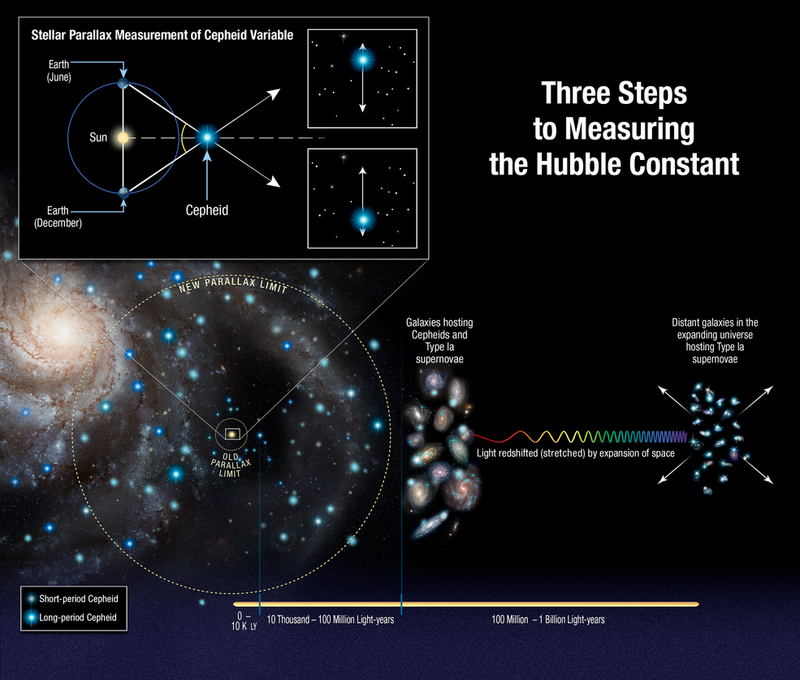 The team has been successful in refining the Hubble constant value by streamlining and strengthening the construction of the cosmic distance ladder, which the astronomers use to measure accurate distances to galaxies near to and far from Earth. The researchers have compared those distances with the expansion of space as measured by the stretching of light from receding galaxies. They then have used the apparent outward velocity of galaxies at each distance to calculate the Hubble constant. But the Hubble constant’s value is only as precise as the accuracy of the measurements. Astronomers cannot use a tape measure to gauge the distances between galaxies. Instead, they have selected special classes of stars and supernovae as cosmic yardsticks or milepost markers to precisely measure galactic distances. Among the most reliable for shorter distances are Cepheid variables, pulsating stars that brighten and dim at rates that correspond to their intrinsic brightness. Their distances, therefore, can be inferred by comparing their intrinsic brightness with their apparent brightness as seen from Earth. Astronomer Henrietta Leavitt was the first to recognize the utility of Cepheid variables to gauge distances in 1913. But the first step is to measure the distances to Cepheids independent of their brightness, using a basic tool of geometry called parallax. Parallax is the apparent shift of an object’s position due to a change in an observer’s point of view. This technique was invented by the ancient Greeks who used it to measure the distance from Earth to the Moon. The latest Hubble result is based on measurements of the parallax of eight newly analyzed Cepheids in our Milky Way galaxy. These stars are about 10 times farther away than any studied previously, residing between 6,000 light-years and 12,000 light-years from Earth, making them more challenging to measure. They pulsate at longer intervals, just like the Cepheids observed by Hubble in distant galaxies containing another reliable yardstick, exploding stars called Type Ia supernovae. This type of supernova flares with uniform brightness and is brilliant enough to be seen from relatively farther away. Previous Hubble observations studied 10 faster-blinking Cepheids located 300 light-years to 1,600 light-years from Earth. To measure parallax with Hubble, the team had to gauge the apparent tiny wobble of the Cepheids due to Earth’s motion around the Sun. These wobbles are the size of just 1/100 of a single pixel on the telescope’s camera, which is roughly the apparent size of a grain of sand seen 100 miles away. Therefore, to ensure the accuracy of the measurements, the astronomers developed a clever method that was not envisioned when Hubble was launched. The researchers invented a scanning technique in which the telescope measured a star’s position a thousand times a minute every six months for four years. The team calibrated the true brightness of the eight slowly pulsating stars and cross-correlated them with their more distant blinking cousins to tighten the inaccuracies in their distance ladder. The researchers then compared the brightness of the Cepheids and supernovae in those galaxies with better confidence, so they could more accurately measure the stars’ true brightness, and therefore calculate distances to hundreds of supernovae in far-flung galaxies with more precision. Another advantage to this study is that the team used the same instrument, Hubble’s Wide Field Camera 3, to calibrate the luminosities of both the nearby Cepheids and those in other galaxies, eliminating the systematic errors that are almost unavoidably introduced by comparing those measurements from different telescopes. The team’s goal is to further reduce the uncertainty by using data from Hubble and the European Space Agency’s Gaia space observatory, which will measure the positions and distances of stars with unprecedented precision. “This precision is what it will take to diagnose the cause of this discrepancy,” Casertano said. The team’s results have been accepted for publication by The Astrophysical Journal. The Hubble Space Telescope is a project of international cooperation between NASA and ESA (European Space Agency). NASA’s Goddard Space Flight Center in Greenbelt, Maryland, manages the telescope. The Space Telescope Science Institute (STScI) in Baltimore conducts Hubble science operations. STScI is operated for NASA by the Association of Universities for Research in Astronomy, Inc., in Washington, D.C. Hubble’s Wide Field Camera 3 was built by Ball Aerospace in Boulder, Colorado.